Hi everybody! Today’s blog tutorial is in honor of all of the dads out there. 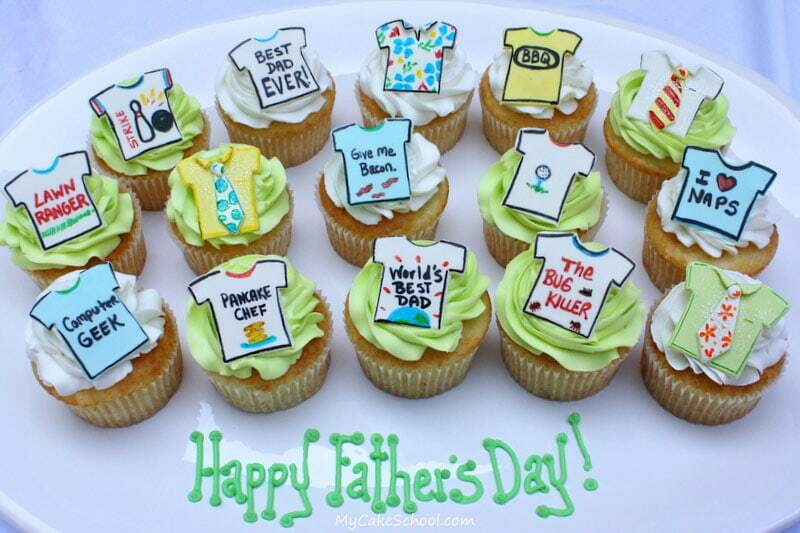 After all, Father’s Day is just around the corner! I’m going with a theme of neckties and t-shirts. 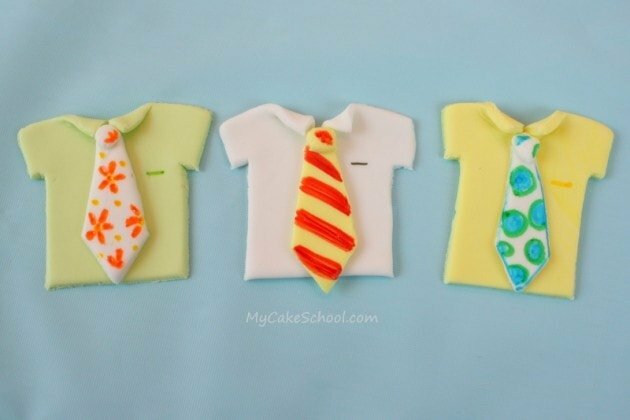 Neckties, because I just think they are just so cute as cupcake topper….and t-shirts–because you can put anything on a t-shirt! 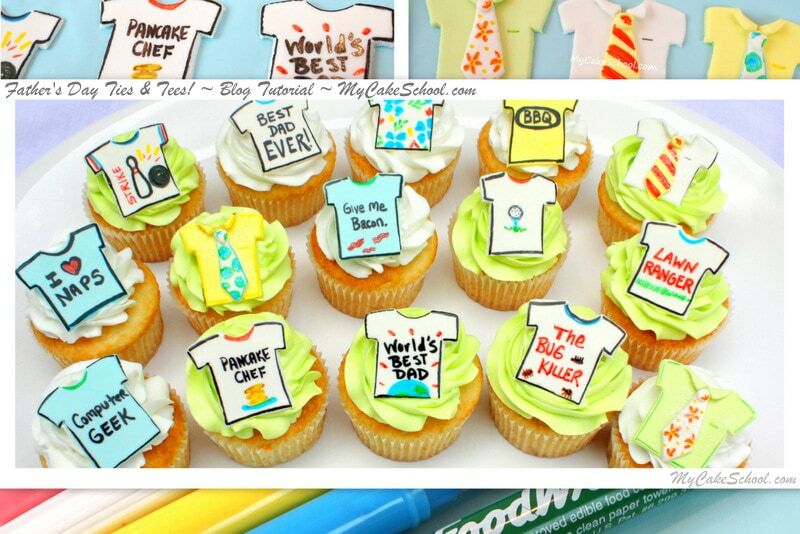 It’s the perfect solution for personalizing the cupcakes to fit the man of honor…and also a great way to add some laughs! Coming up with a theme for Father’s Day can really be tricky–since not every dad is into golf or fishing..(or even neckties)! I think this is the perfect answer…and it’s so easy too! First, you’ll need something to make a shirt with. 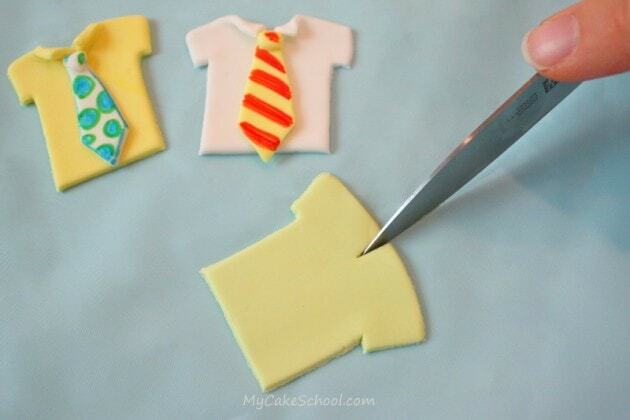 They do make t-shirt cookie cutters…but if you have a square cutter, that is all you really need. (I wish we had figured this out before buying the way-too-big t-shirt cookie cutter this morning). We actually used the same square cutter to create both t-shirts & collared shirts. I rolled out some fondant (with a little tylose powdered kneaded in for quick drying.) Here I am forming my shirt with a 1 1/2 inch square cutter. Of course, don’t feel obligated to get the exact size as mine. 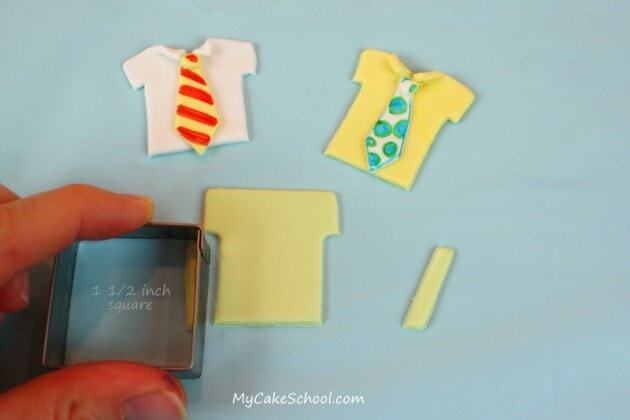 Next, just snip away the lower edges of the square, to form two short sleeves. 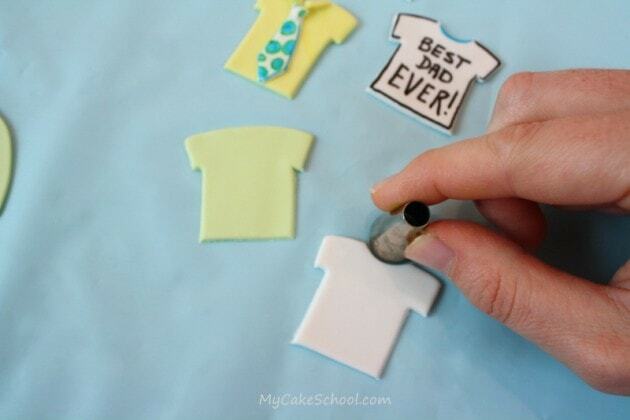 Father’s Day Cupcake Tutorial by MyCakeSchool.com! I then turned the short sleeves downward just slightly. Here is the point where you’ll change your technique a little depending on if you are making a t-shirt or a shirt with a collar. On the right, you can see that I formed a t-shirt neck with the bottom end of a standard piping tip. That’s it! 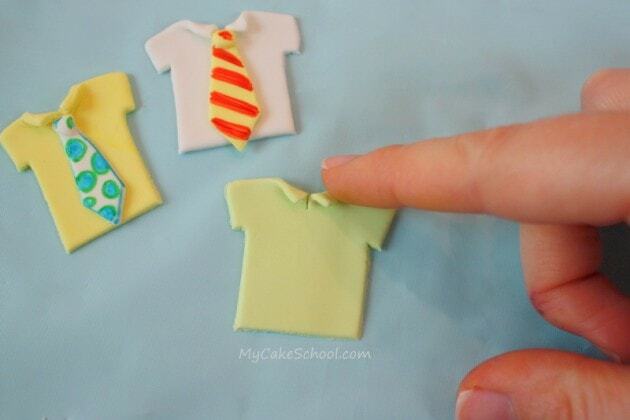 Creating a shirt with a collar is very simple too. Rather than cutting out a half circle for the neck as we did above, I just created a small slit with a sharp knife. Then, I folded down the two sides to create the collar. This can be an easy golf/polo shirt look, or a short sleeve button down (which is the look I went with). 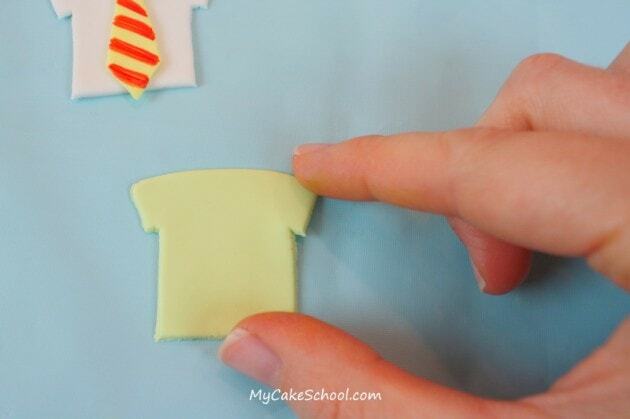 *Let your shirts dry on a surface dusted with a little cornstarch or powdered sugar to prevent sticking. Then, I placed the tie (dampened in back with a little water) onto the shirt, and pressed a little dot of fondant at the top to create the knot of the tie. As you’ve probably guessed already from the pictures above, food coloring pens play a big role in decorating the toppers! I had so much fun with this part. 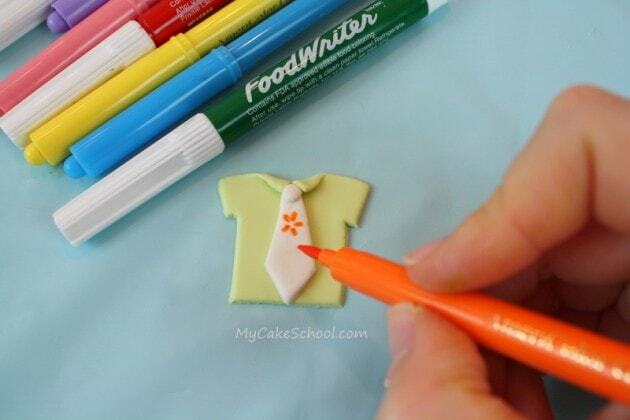 Once your fondant has set, you can easily write your messages or designs. There are several brands out there…but the ones that I used today were Americolor and FoodWriter pens. If you don’t have any food coloring pens, you can also create a paint by mixing a little vodka or lemon extract with food coloring gel. I use vodka. Then, just brush it on with a tiny brush or toothpick. I only made three shirt and tie combos–so much fun though! Finally, it was time to decorate the t-shirts! My favorite part. I made t-shirts that apply to my husband (and I suspect a lot of other dads out there)! He gave them his stamp of approval :0) — Cafepress.com has some really funny shirts & sayings which are great for inspiration too. That’s all there is to it~ We’re done! — Now they just need to find a cupcake to call home. Just fyi, I don’t trust airtight containers with my cupcakes –especially if they are topped with fondant toppers. The risk of peeling liners or softened fondant accents is too great. You want your containers to breathe a little to be on the safe side! I hope that you enjoyed this tutorial! Feel free to borrow my shirt designs or come up with your own twist! I can’t wait to see what you come up with! « Gum Paste Anemones & Vertical Texturing of Buttercream- Video! Oh golly!!!!!!! 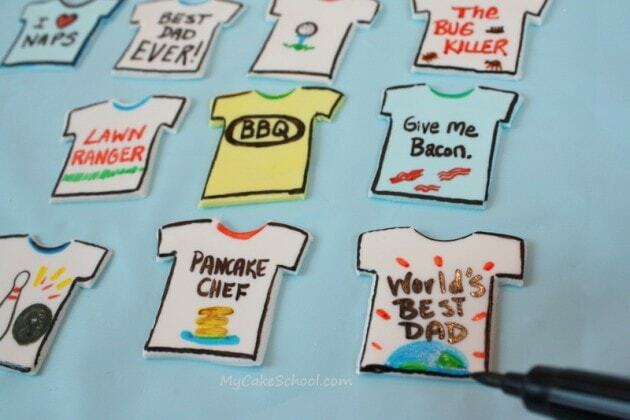 How great for DAD…Making these would be a present for HIM and ME..WIN WIN! I love all your fun sayings on the T-Shirts, that is a great way to personalize! Love it! 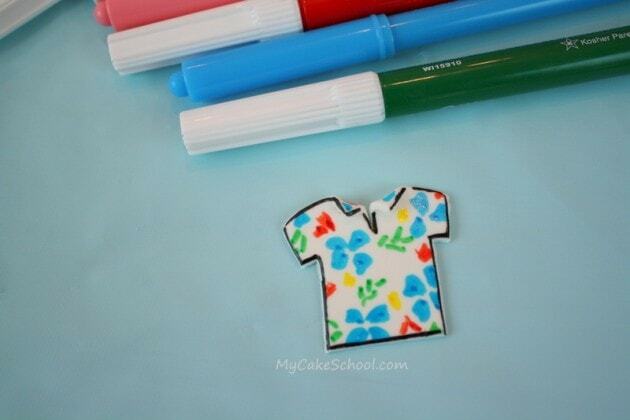 I like the way you made the collared shirts. These are so cute!! 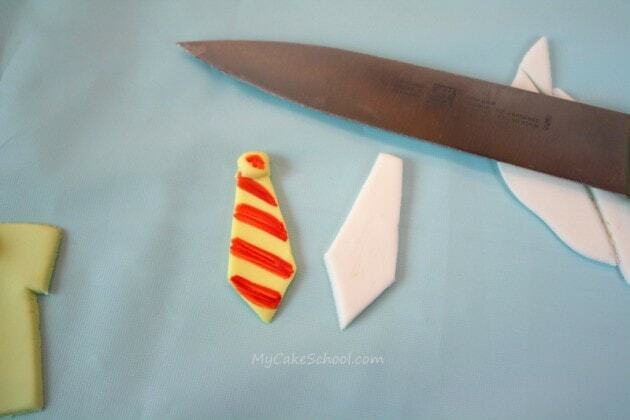 Is there a reason that you typically use fondant with tylose to make your cake decorations? I just wondered if it was a personal choice or if it holds up better or something like that? I just seem to prefer gum paste but wonder if I should be more fair and give fondant a chance! @Sophie– Good question! It’s just personal preference. I actually prefer to use gum paste for my cake toppers (figures, flowers, numbers, bows, etc.) —I make an exception with cupcake toppers though for fear that people will try to eat them! Adding just a little tylose gives me a happy medium…I can roll them a little thinner, they will dry a little more quickly, but they won’t become rock hard. Melissa, I couldn’t agree more with everyone, they are lovely, cute and fun! Thank you so much for sharing!! Thanks for the great idea! Just bought a new car and wanted to make a “thank you” for the salesman, plus, he’s a new daddy! I made shirts to represent both. Also, made some of my shirts like tank tops. Pictures didn’t turn out well so won’t post. Great Fathers Day ideas. So easy. Been out of state for one week and couldn’t wait to get back to my computer and this cake school. Oh thanks for this tutorial!! I cant wait to make it!! Hi Brenda, we used the AmeriColor Gourmet Writer, we order it online. Oh so cute!! Thanks for sharing!! Fantastic ideas. I absolutely love being part of your wonderful school as I learn so much. A big thank you from Australia ? ?